^ Lydekker, R. (1877). "Notices of new and other Vertebrata from Indian Tertiary and Secondary rocks." Records of the Geological Survey of India, 10(1): 30-43. ^ 2.0 2.1 Wilson, J.A. and Upchurch, P. (2003). "A revision of Titanosaurus Lydekker (Dinosauria – Sauropoda), the first dinosaur genus with a 「Gondwanan」 distribution." Journal of Systematic Palaeontology, 1(3): 125-160. ^ Jain, Sohan L.; Bandyopadhyay, Saswati. New Titanosaurid (Dinosauria: Sauropoda) from the Late Cretaceous of Central India. 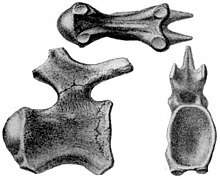 Journal of Vertebrate Paleontology (Norman, Okla.: University of Oklahoma). 1997, 17 (1): 114–136 [December 31, 2012]. ^ Titanosaurus. Comic Vine. [December 31, 2012].